TRT Lighting Ltd designs, manufactures and supplies energy efficient, environmentally friendly lighting products for exterior lighting markets. Involved in designing lighting for civil engineering projects such as roads, tunnels, airports, urban centres and amenity lighting. They are also very active in the high demand market of outdoor HID lighting replacement and retrofitting with LED luminaires. TRT needed to produce an exacting, inert seal on the top lid of an outdoor LED light fitting to meet IP66 requirements and lasting throughout the life of the product. The seal was being achieved by manually applying an adhesive backed pre-cut gasket on the production line. With high order demand and volumes of finished product significantly increasing, the need to expedite certain elements of the assembly process at TRT were paramount. 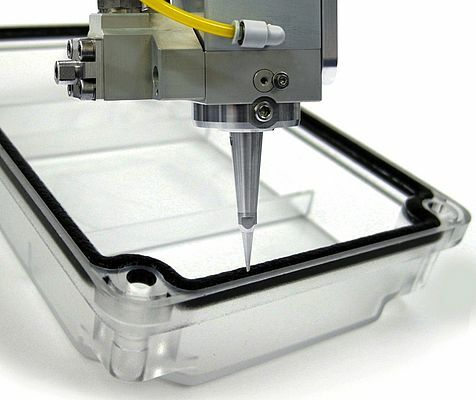 After tests and trials on a sample lid Steve Green, Techsil’s Application Engineer recommended a bespoke FIPFG (Form in Place Foam Gasket) service where a sophisticated six axis robot dispenses a single-component liquid polyurethane foam bead onto a customer’s substrate. The PU cures forming a fine, uniform, closed cell foam structure. The FIPFG service not only allowed TRT to increase their productivity but also provided a high quality, reliable solution that passed all relevant testing and verification. “Short cycle times save time and money. If a manufacturer produces small volumes or has intermittent production, then subcontracting their FIPG system can be very cost effective,” says Green.